Here in the US, when we think pancakes, we think the fluffy buttermilk sort, doused with maple syrup perhaps, or bubbling blueberries. 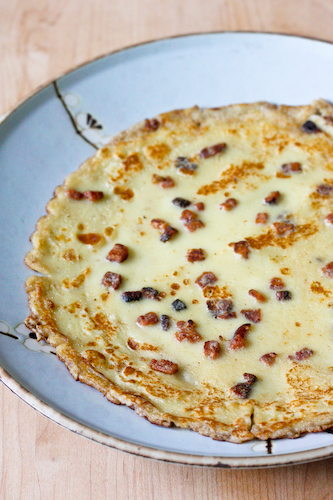 The true Norwegian pancake, however, is a savory affair, with bits of browned bacon studding a thin, almost crepe-like batter. Sprinkled with sugar and folded in fourths, they're eaten for dinner, with little else beside. You don't need much else, as these are pretty filling. Dream-inducing even, if you put your head down for a second after dinner. R's dad is usually in charge of the pannekaker making in his family. And since R comes from such a large one (5 kids!) he remembers his father cooking up huge stacks to satisfy the masses. Since it's his recipe, this project was R's deal, and I'm not even sure I was awake when the actual cooking was going on. Oh, I know, I said they're meant for dinner. We had them on a Sunday early afternoon, which is basically a Sunday morning. You can still totally eat these for breakfast, after all. I mean, bacon, pancake batter and sugar. Sounds like breakfast to me! Sift the flour, sugar and salt together, then mix in half of the milk until it's smooth. Then mix in the rest of the milk and beat in the eggs. Allow the batter to rest for 1/2 hour before cooking. In the meantime, your bacon should be chopped, so heat a small skillet over medium heat and brown the bacon until you have crunchy bacon bits. You don't need extra fat, since the bacon will render much of its own. After the batter is finished resting, heat an 8" skillet over medium heat and spread a thin layer of batter over the bottom (see the picture above). You can tilt the pan to help spread it around evenly. 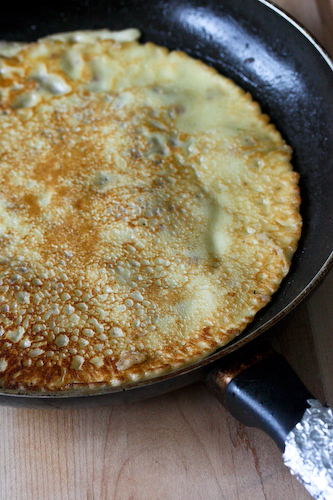 The pancake should pretty much fill the skillet and be about the thickness of a crepe. As the first side cooks, sprinkle some of the bacon bits over the top of the still-raw side. When the cake becomes solid, which doesn't take very long, flip it over and cook until done on the other side. Transfer to a plate while you finish up with the rest. Serve with sugar, which should be sprinkled over the pannekaker. Fold into fourths and enjoy. 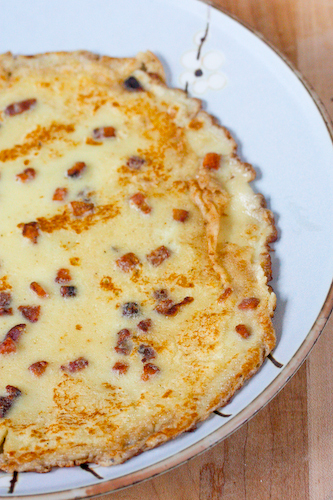 UPDATE: I've changed the title of this post from 'Norwegian Savory Pancakes' to 'Norwegian Dinner Pancakes' because these aren't so much savory (sprinkling them with sugar pretty much takes care of that) but they are for dinner. Yum! My dad used to make "roll ups" for our weekend brunches. They were thin crepes that we were allowed to fill with anything, although my sweet tooth meant that mine were usually fruit-filled. Bacon makes everything better, though, so I have no doubt that these are the perfect dinner (or brunch)! mmm those pancakes look really tasty!! Num! Det beste jeg vet! I like pannekaker with blueberry jam.